Pharmacy Daily today has three pages of news including our weekly Health & Beauty feature plus a full page from Pharmacy 4 Less. SHPA hatches a trip THE Society of Hospital Pharmacists of Australia has opened registrations for the upcoming SHPA inaugural 2019 International Incubator, taking place 31 Aug-06 Sep in Tokyo, Japan. The week-long intensive program will enable pharmacists to “critically self-assess and plan for leadership and success,” according to SHPA CEO Kristin Michaels. Key speakers include Peter Fowler from Launceston General Hospital, Jane Booth of Monash Health and co-host of the Purple Pen Podcast, and Duncan McKenzie from the Royal Hobart Hospital. CLICK HERE for details. Alcohol burden ONE in 166 people in Australia (aged 10+) were treated for alcohol and other drug use in 2017–18, according to a report from the Australian Institute of Health and Welfare (AIHW) - aihw.gov.au. and managed appropriately.” The RACGP submission also flagged concerns about potential medication errors as a result of pharmacist prescribing. “The changing nature of the pharmacist’s role will inevitably affect general practice patients,” the college said. “It is important that discussions regarding the role of pharmacists continue to be undertaken in collaboration with the RACGP.” The RACGP said the extension of pharmacy practice to include prescribing would have an impact on the cost of pharmacists’ indemnity insurance, but also raised concerns that GPs’ premiums would also increase. “The RACGP suspects that GPs’ premiums would increase as they would be responsible for supervising a prescriber who could increase their own medicolegal risk,” the college said. The RACGP said if any of the proposed models were implemented pharmacists should be mandated to take out a higher level of indemnity cover. A NSW-BASED pharmacist will be unable to practise for at least 18 months after admitting to abusing prescription painkillers to ease physical and emotional pain. The NSW Civil and Administrative Tribunal heard that in 2016, Luke Pickett had misappropriated a number of schedule 8 medicines from a New England pharmacy he was managing - taking a total haul of 588 tablets including oxycontin, alprazolam and methylphenidate. Pickett also confessed to working as a pharmacist while “impaired” by opioid misuse. The Tribunal was told Pickett blamed his abuse of oxycontin on “chronic back pain, [the] death of his grandfather and mostly as a result of [a] breakdown [of a] professional relationship with one of the pharmacists at his workplace”. Pickett’s misuse of prescription drugs was identified after a member of staff at the pharmacy flagged concerns about his behaviour, prompting a stock check of S8 drugs of addiction, which discovered discrepancies. The Tribunal also heard Pickett was found by police on 01 Nov 2016 in possession of cannabis and prescription medicines. Personal import rules THE TGA has detailed the “personal importation scheme” which allows some medicines to be brought into Australia, including many unapproved items - tga.gov.au. This week Pharmacy Daily & skinB5 are giving away each day their NEW premium products Acne Control Australian Botanicals Cleansing Mousse and Acne Control Australian Botanicals Hydration Essence valued at $85.90. The advanced hydration essence uses 8 anti-acne Australian botanical extracts to effectively nourish, heal & restore a healthy skin barrier. Using cutting-edge cellular extraction, the ingredients’ natural powers are harnessed to deliver maximum benefits to your skin. For more info see www.skinB5. com. To win, be What is the daily the first usage of the Acne person Control Australian from WA, Botanicals Hydration SA or NT to Essence? send the correct answer to comp@ pharmacydaily.com.au Congratulations to yesterday’s winner, Kerri Barwick. hefty 26% to $54 million. “We continue to diversify our domestic customer mix and we have seen improvements during the quarter,” Blackmore noted. He said the company’s Board was continuing its “extensive search” for a new CEO, “and this process is progressing well”. The outlook for the company is for “modest full-year revenue growth,” Blackmore added. GP rego suspended A RESIDENTIAL care facility GP, Judith Silberberg, servicing around 300 patients, has had her registration suspended for six months, after which she will be subject to conditions resulting from a Health Care Complaints Commission arraignment. Silberberg, who had administered “high doses” of some drugs, will not be able prescribe S8 drugs or midazolam and be subject to practice audits - caselaw.nsw.gov.au. healthSAVE Wilkinson’s Pharmacy offers a range of professional services to the local community including: in-store IVF dispensing and counselling, diabetes and cardiovascular screening, Home Medication Reviews, disability carer support and education service as well as regular on-site health education programs for locals. Pictured with Health Minister Greg Hunt is the happy healthSAVE Wilkinson’s Pharmacy team. Always read the label. If symptoms worsen or change unexpectedly, talk to your healthcare professional. Follow the directions for use. 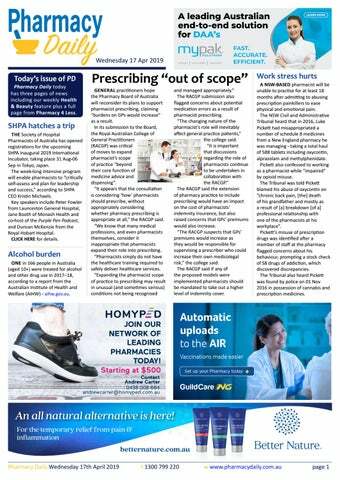 www.pharmacydaily.com.au Pharmacy Daily is part of the Business Publishing Group family of publications. Pharmacy Daily is Australia’s favourite pharmacy industry publication. Grab your latte-to-go the sustainable way in one of these reusable 350ml Cheeki Coffee Mugs. The double-walled insulation will keep your brew hot for up to eight hours – perfect for the morning commute. Constructed from 18/8, food grade stainless steel, the mugs feature a unique, leakproof pop-up lid with a 360° drinking surface. Available in four fresh colours – pink, orange, chocolate & topaz. Cheeki is a proudly Australian brand and all products are BPA + toxin free. 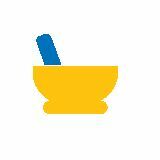 MediChoice Epsom Salts are now available in a mega value 1kg pack. Are you stressed? Suffering from aching muscles and sore joints? Relax with an Epsom salts bath. Magnesium sulfate (Epsom salts) is also widely used by gardeners, particularly on citrus plants. MediChoice Epsom Salts are unscented, fine crystals, which dissolve easily in water. Available now to order via API and DHL. When it comes to pain relief, Nurofen knows speed of action is important to consumers, with seven out of 10 Australians looking for a pain relief product that “is absorbed quickly for fast relief”. Containing ibuprofen lysine, Nurofen Quickzorb is proven to be absorbed quickly into the bloodstream. For the temporary relief of pain and inflammation. This medicine may not be right for you. Read the label before purchase. Follow the directions for use. Incorrect use could be harmful. If symptoms persist, talk to your health professional. Chemists’ Own has launched its new product, Nystatin Oral Drops. Chemists’ Own Nystatin Oral Drops provide effective relief from oral candida albicans – also known as oral thrush. Oral candida is a fungal infection of the mouth caused by an imbalance between bacterial and fungal growth. This medicine may not be right for you. Read the label before purchase. Follow all directions for use. If symptoms persist, talk to your health professional. Pharmacy Daily is a publication of Pharmacy Daily Pty Ltd ABN 97 124 094 604. All content fully protected by copyright. Please obtain written permission to reproduce any material. While every care has been taken in the preparation of the newsletter no liability can be accepted for errors or omissions. Information is published in good faith to stimulate independent investigation of the matters canvassed. Responsibility for editorial comment is taken by Bruce Piper.